YUMA, Ariz., Oct. 11, 2011 -- Northrop Grumman Corporation (NYSE:NOC) successfully demonstrated the Highly Adaptable Multi-Mission Radar (HAMMR), which is a derivative of the Defense Department's Ground Based Fighter Radar (GBFR), a multi-mission ground tactical radar designed to provide the U.S. Army with counter-rocket, artillery and mortar (C-RAM) as well as air defense capabilities while "on-the-move." 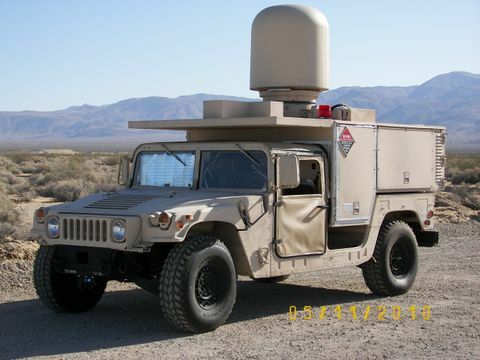 The GBFR contract was awarded to Northrop Grumman in 2009 by the U.S. Army Aviation and Missile Research, Development and Engineering Center at Redstone Arsenal, Ala.
"HAMMR's on-the-move capacity, as demonstrated at Yuma, will provide the U.S. ground forces with critical capabilities that ensure mission success in today's irregular warfare environment," said John Jadik, vice president of weapons and sensors for Northrop Grumman's Land and Self Protection Systems Division. "This demonstration further positions Northrop Grumman as a leader in AESA technologies." The heart of the HAMMR system, the AESA, is composed of more than a thousand programmable transmit/receive modules that enable HAMMR to successfully detect, track and engage numerous target types, at multiple positions, and in varying paths and trajectories. The flexibility of HAMMR's AESA architecture enables growth to address new threats without redesigning the system, a major benefit compared to existing radar systems.